Lamoe-Healthier, easier, smarter life. Instant pot accessories, and also accessories for Fagor, Cosori, Crock Pot, Nuwave, Mueller, Bella pressure cooker. Steamer Basket-The handle is covered by the silicone, which is designed to take out from the pot easily. Non-sticky Springform Pan-This can be quickly released. The covered reinforced coating is durable. Silicone Egg Bites Molds-The lid is also silicone. It's safe to warm it together with food. 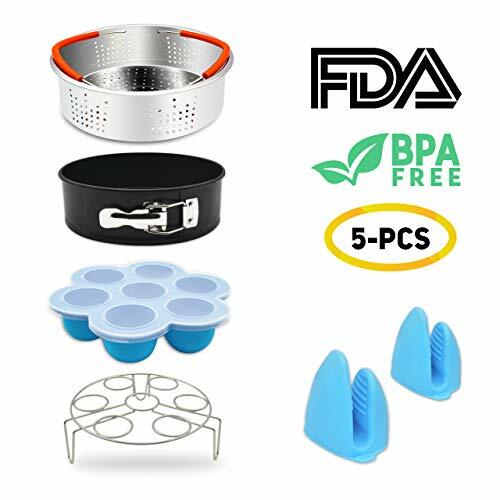 Stainless Steel Egg Steamer Rack-You can use it with steamer basket, springform pan and silicone egg bites molds together. It's really easy to use. Anti-scald Gloves-This is used to take out food from instant pot. It can block the temperature up to 482℉. 1.Why my springform pan leak? The radio is not correct. With the correct radio, you can make a perfect cake and the springform is tight enough to hold the cake liquid. 2.Why my springform pan is easy to get rusted? The reinforced coating can be scratched by sharp things. After scratched, it will easy to get rusted. And also, after you wash it, please remember to dry it for a life time use. 3.How to wash my instant pot accessories? We recommend to wash by hands. It's easy to wash- let it soak a few minutes, and then wash it. 【Satisfy All Your Need】This ip accessories set including 304 stainless steel steamer basket, springform pan, egg bites molds, egg steamer rack and a pair of anti-scald gloves. The accessories can fit 5/6, 8 quart instant pots and similar sizes pressure cookers very well. Not only giving you a fantastic cooking experience, and also a healthy life for all of your families. 【Steamer Basket-Silicone Covered Handle】Food grade stainless steel(FDA and BPA free), sturdy construction. This food steamer can be used to steam vegetables, seafood, dumpling or even sterilizing baby items. The non-slip silicone handle is designed to pick it up easily and in case of falling off. 【Springform Pan-Easy to Separate From Cake】The springform pan is really convenient to make a plain yellow cake or a cheese cake with the correct radio. And the cover with reinforced coating, so the cake can be quickly released. 【Silicone Egg Bites Molds-With Silicone Lid】This egg bite mold can be used in the freezer, microwave and oven. Good for baking egg bites, egg muffins, Yogurt, ice cream. To be a genius cooker to cook delicious food. And the silicone lid is totally different from plastic, it's safe to warm and healthy to all your families. 【Lamoe Warranty】30days money back and 12 months warranty. The instant pot set is created to provide a healthier and easier life to every family. All of our products have the FDA certified and BPA free, so there is no worry to use our products. If you have any questions about this product by Lamoe, contact us by completing and submitting the form below. If you are looking for a specif part number, please include it with your message.